Secretary of State Mike Pompeo testifies during a hearing before Senate Foreign Relations Committee Wednesday on Capitol Hill in Washington, D.C.
Committee Chairman Bob Corker, R-Tenn., was blunt in his opening statement, telling Pompeo that "in the summit's aftermath, we saw an American president that was submissive and deferential" toward Russia and that senators were concerned the White House was simply "making it up as they go" in regards to U.S. foreign policy. In his testimony, Pompeo maintained that he, the president and the administration have set a firm tone with Russia, and announced the formalization of U.S. policy that "does not and will not recognize the Kremlin's purported annexation of Crimea." Pompeo said that he had underscored to Russia that there would be "severe consequences" if the country again tried to interfere in U.S. elections, but that overall the summit had been a step toward better diplomatic relations with a major player in world affairs. "Now is the time for direct communication in our relationship in order to make clear to President Putin that there is the possibility — however remote it might be — to reverse the negative course of our relationship," Pompeo said. But Corker, often a vocal critic of the Trump administration, pressed the secretary of state further later in the hearing, asking somewhat incredulously how Trump's public rhetoric — dismissing the Justice Department's Russia investigation as a hoax, lavishing praise on Putin, sowing distrust in NATO and more — could run so counter to the administration's goals Pompeo continued to stand behind. "So why does he do those things?" Corker asked. "Is there some strategy behind creating doubt in U.S. senators' minds on both sides of the aisle? Doubt in the American people as to what his motivations are when in fact we have tremendous faith in you?" Pompeo pushed back, saying he disagreed and claimed that some of Trump's statements "actually achieve important foreign policy matters for America." He urged senators to look at the results and the sanctions that had been put in place, and seemed to suggest that Trump's statements weren't always indicative of U.S. foreign policy. Pompeo later sought to clarify that statement, admitting that "it is the case — the president calls the ball. His statements are, in fact, policy." Pompeo got especially testy when pressed by the committee's ranking member, Sen. Bob Menendez, D-N.J., about what happened in Trump's one-on-one meeting with Putin. "As of this moment, we find ourselves in an unimaginable situation. The American people, elected officials in this body and members of the president's own Cabinet have heard more about the meeting in Helsinki from Putin and his associates than from" Trump himself, Menendez said in his opening remarks. Pompeo maintained it wasn't improper for presidents to have solo meetings with world leaders and said that he had gotten "a pretty complete understanding of what happened" during "a number of conversations" with Trump, though the secretary of state wouldn't elaborate on many more specifics and said he hadn't talked with the interpreter in the room and hasn't seen any of the interpreter's notes. "Presidents are permitted to have conversations with their Cabinet members that aren't repeated in public," Pompeo pushed back to Menendez. Menendez later told NPR's Ari Shapiro on All Things Considered that he walked away from the hearing convinced Pompeo has no idea what went on during the Trump-Putin meeting. "It's kind of shocking that you go into a meeting for two hours and you don't have your secretary of state or your national security adviser or the director of national intelligence with you because that allows the Russians to ultimately characterize the discussion, as they are doing, without a counter to it," Menendez told NPR. During a second tense exchange at the close of the hearing, Pompeo accused Menendez of delivering a "political soliloquy" to him. But Menendez went back harder, telling Pompeo that "if President Obama did what President Trump did in Helsinki, I'd be peeling you off the Capitol ceiling." Pompeo wouldn't say whether or not Trump and Putin discussed relaxing sanctions, only that U.S. policy had not changed, and he did signal the administration would be open to more sanctions. Shortly before Pompeo's testimony began, the White House announced they had postponed a second meeting with Putin here in the U.S. until next year and until "after the Russia witch hunt is over." Trump's sit-down with Putin last week in Helsinki stirred up a firestorm of criticism from Republican and Democratic lawmakers after Trump questioned the assessment of U.S. intelligence agencies that Russia interfered in the 2016 election. Once he was back in the United States, Trump attempted to correct his statement on Russian interference, saying that he does accept the findings of the U.S. intelligence community. Pompeo told the committee that he's confident Trump "has a complete and proper understanding of what happened" with Russian efforts to interfere in U.S. elections — because he briefed the president regularly on it when he was previously the director of the CIA. Questions remain about what exactly Trump and Putin agreed to during their two-hour sit-down when no other advisers were present. The White House has not released a detailed readout of the meeting. Pompeo said on Tuesday that "many things" came out of the meeting between the leaders, but he offered few specifics other than mentioning an agreement to set up a business council. He defended the summit, saying that ultimately the world will benefit from the talks. "I think one of the things that gets lost is the determination this administration has had in pushing back against Russian malign behavior around the world," he also said Tuesday. Lawmakers also grilled Pompeo on North Korea after the other historic summit Trump held this year. The secretary of state told the committee that the U.S. is "engaged in patient diplomacy, be we will not let this drag out to no end," and that he remains "engaged in a complex negotiation with North Korea." 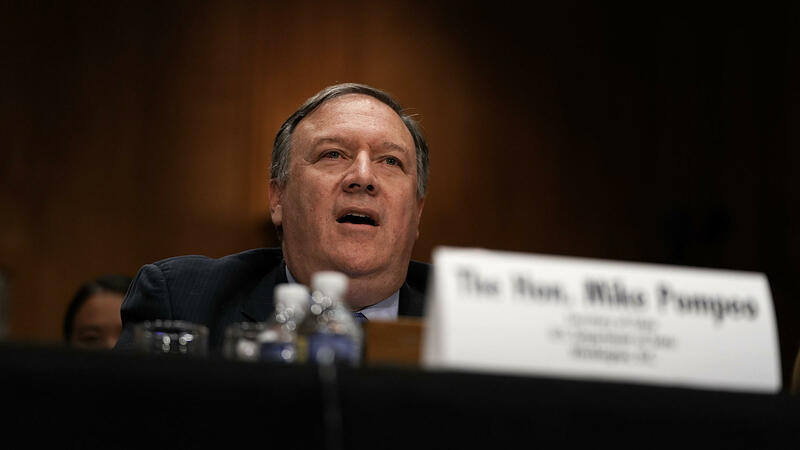 "I am very confident that the North Koreans understand our definition of denuclearization and have agreed to it," Pompeo told senators. Sen. Ed Markey, D-Mass., told Pompeo he feared "the Trump administration is being taken for a ride" when it comes to North Korea. "Fear not, Senator. Fear not," Pompeo retorted. Trump has boasted that his meeting with North Korea's Kim in Singapore in June was a success. He even went so far as to tweet that the country was no longer a nuclear threat. The news out of North Korea since those talks were held has been mixed, though. After Pompeo held a follow-up meeting with senior North Korean officials in Pyongyang earlier this month, North Korea's foreign ministry called the discussions with Pompeo "regrettable." But, a recent report from a North Korea expert concluded that Pyongyang has begun dismantling key facilities at a satellite launching station. "It'd be entirely consistent with the commitment that Chairman Kim made to President Trump when the two of them were in Singapore together," Pompeo told reporters on Tuesday when asked about the finding. "We've been pressing for there to be inspectors on the ground when that engine test facility is dismantled," Pompeo added Tuesday. Pompeo was also expected Wednesday to be questioned about Iran. Pompeo gave a speech Sunday that called the country's leaders corrupt. He made a direct appeal to the Iranian people, saying the U.S. stands with them. Trump followed Pompeo's speech with a tweet in all capital letters that warned Iran against threatening the United States. The White House has said Trump was simply responding to rhetoric from Iran and that the administration will do what is necessary to ensure that Iran does not get nuclear weapons. Trump pulled the U.S. out the Iran nuclear agreement in May, arguing it was a bad deal that did not do enough to rein in bad behavior from Iran.